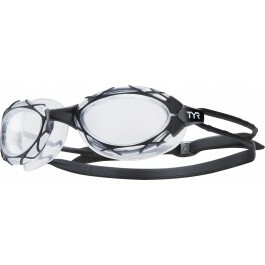 Go fast or go home with TYR Nest Pro Adult Goggles. Inspired by the unique nest-like architecture of Beijing's 2008 Olympic stadium, the LGNST goggle frame boasts an innovative, grid-like construction that sets it apart from competitors. Ideal for both male and female athletes, the LGNST features a unibody design and wide peripheral range. Equipped with embedded anti-fog, these latex free swimming goggles also retain clarity without the need for traditional anti-fog spray application, making them a great choice for triathlons, open water and training. I have tried numerous googles from different company’s and the nest pro are the best by far. Could hardly tell I had goggles on! Very comfortable! Great field of view. Have a large headso hard to find goggles that fit. These fit well, are comfortable and dont fog. Only problem is last pair Worcester out and lost suction. 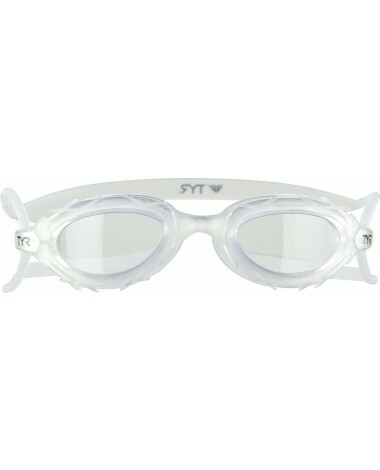 Q: Are any goggles (triathlon and/or swimming) available in prescription? Thank you. Q: Does spitting into the goggles help prevent fogging? Do you recommend spitting into goggles pre-swim? A: Many people believe it does work. Spitting in your goggle can prevent fogging because it creates a thin layer on your goggles that prevents fog molecules from sticking together. The Nest Pro is equipped with embedded anti-fog, so you should not need to use this method. But it will not hurt either. Q: How do you clean the Nest Pro lenses with the embedded anti fog? Can you wipe them? Is the anti fog treatment just on the surface of the lens? A: Thank you for your inquiry. We recommend storing your goggle in a case once used. This will help prevent any scratches to the lens. We recommend to rinse the goggles in cold water before and after each use and let air dry. Please refrain from using a towel or cloth because this can scratch the lens also. We do make a anti-fog spray that you can spray on the inside of your lenses to help prevent the goggles from fogging up. For your convenience we have included a direct link below: http://www.tyr.com/shop/ssearch/?q=nest+pro Customer Service is our top priority. If you have any additional questions, or require additional assistance, please feel free to contact us via Live Chat or telephone (1-800-252-7878). We offer Live Support Mon-Fri 9AM-5PM PST. Q: Are these lenses tinted? Is the nosepiece solid black?. A: Thank you for contacting TYR Sport! We are always eager to answer any questions you have about our products. Our Nest Pro goggles do come in darker lenses. We offer a blue lens, and also a couple different gasket colors with a smoke lens. Our nose pieces are solid black. Q: How do I get a RX lens and how much does one cost. A: Thank you for your inquiry. Unfortunately the only corrective optical goggles we carry are the Corrective Optical Goggles and the Big swimple Corrective Goggles. The Nest Pro performance goggles showcase a Unibody Design to fit various facial types, and feature Wide Peripheral Range for optimal sighting. Ideal for open water use.